MOVE IN READY HOME WITH TONS OF UPGRADES IN HIGHLY DESIRED MIDLOTHIAN AREA! No Detail was Left Undone w/Showstopping Renovations Throughout Including Hardwood Flooring, Granite Counters, Detailed Moldings, Updated Baths & Tile Floors! Grand Two Story Foyer Welcomes You In w/Gleaming Red Oak Hardwoods & Opens Into the Stunning Dining Room w/Picture Frame Molding, Chair Rail & Gorgeous Chandelier. Kitchen is Perfect for Entertaining w/Large Center Island, Granite Counters, SS Appliances, Tile Backsplash, Gas Cooking, Oak Cabinets w/Pull Out Shelving & Breakfast Nook w/Large Bay Window. Family Room Features Gas FP/Mantle, Plantation Shutters & Crown Molding and Opens to Sun Room Offering Extra Living Space! Exquisite Half Bath is Unique w/Custom Made Vanity w/Jade Vessel Sink. Resort Style Master Suite Boasts Birch Floors, 2 WI Closets w/Built In Shelving & Spa Like Ensuite Bath w/Double Vanity, WI Shower w/Multiple Shower Heads, Tile Floors & Jetted Tub w/Stone Surround. Second Floor Includes 3 More Bedrooms Consisting of Oversized Closets & Plush Carpet & Another Full Bath w/Tub/Shower. Two Car Attached Garage & Detached Shed Offers Extra Storage Space. Private Cul De Sac Location! Directions:Courthouse Road to Right on Lucks Lane, Go Approximately 1 Mile to St James West Entrance, Turn Left on Explorer Drive, Turn Right on Moven Place. House is at the End of the Cul De Sac. SchoolsClick map icons below to view information for schools near 11818 Moven Place Midlothian, VA 23114. Home for sale at 11818 Moven Place Midlothian, VA 23114. Description: The home at 11818 Moven Place Midlothian, VA 23114 with the MLS Number 1903440 is currently listed at $305,750 and has been on the Midlothian market for 71 days. 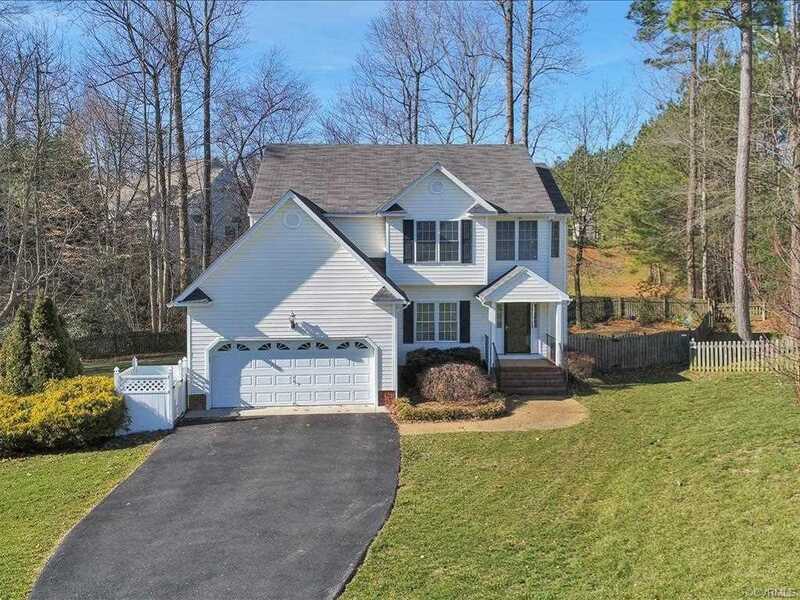 You are viewing the MLS property details of the home for sale at 11818 Moven Place Midlothian, VA 23114, which is located in the St James Woods subdivision, includes 4 bedrooms and 3 bathrooms, and has approximately 1920 sq.ft. of living area.